The world’s ocean has historically been slightly on the basic side of the acid-base scale of pH. However, decades of scientific monitoring and research reveal that the current pH of seawater is dropping towards the acidic side of the scale, as carbon dioxide in the atmosphere increases more rapidly than perhaps ever before. 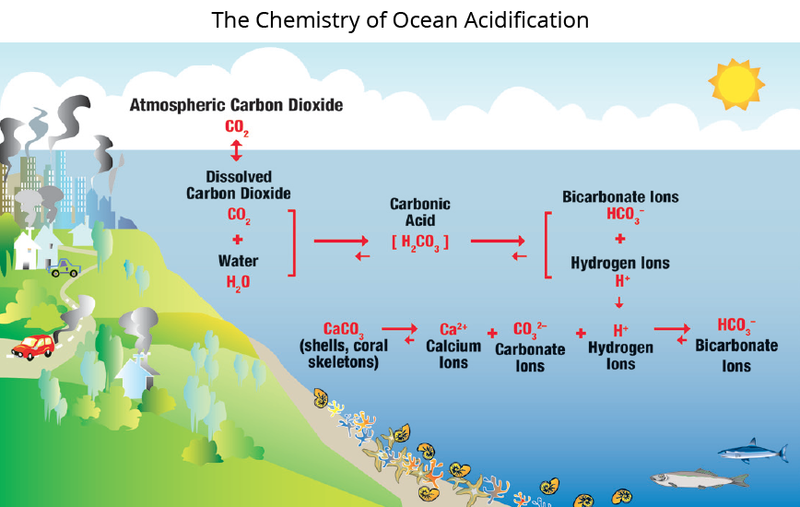 When carbon dioxide (CO2) from the air is absorbed by seawater, chemical reactions occur that form carbonic acid. They also reduce the amount of dissolved calcium carbonate minerals, which are the building blocks for the skeletons and shells of many marine species. These chemical reactions are termed ocean acidification, or OA. Since the beginning of the Industrial Revolution, the pH of surface ocean waters has fallen by 0.1 pH units. Because the pH scale is logarithmic, this change represents approximately a 30 percent increase in acidity. Predictions indicate that the oceans will continue to absorb carbon dioxide and edge closer to acidic. Estimates of future carbon dioxide levels, based on business-as-usual emission scenarios, indicate that by 2100 the surface waters of the ocean could be nearly 150 percent more acidic, resulting in a pH that the oceans haven’t experienced for more than 20 million years. While carbon dioxide is the driving force behind ocean acidification, near the coast additional factors can contribute to even greater acidification. The chemistry of coastal waters can be influenced strongly by rivers, which bring dissolved and particulate carbon, nutrients, and fresh water into the ocean. Nutrients promote acidification by spurring the growth of algae and phytoplankton, which in turn leads to intense respiration by animals that eat them, and the respiration drives up the local CO2 concentration in the water. Carbon dioxide from respiration has the same effect on pH as carbon dioxide from the atmosphere. Plumes of water outside river mouths can even become corrosive to shells and skeletons made of calcium carbonate. These coastal processes are called coastal acidification, or CA, to distinguish them from the more general process of ocean acidification. The Northeast Coastal Acidification Network (NECAN) focuses on coastal acidification in the northeastern United States in the context of broader ocean acidification. We use the term ocean and coastal acidification, or OCA, for the collective process of acidification of seawater. New England faces an elevated risk for OCA because its coastal waters are not well buffered against acidification, compared to southern U.S. coastal waters. A well­-buffered solution’s pH changes very little when an acid is added. In the case of OCA, carbonic acid is generated when CO2 is added to the water (either from the atmosphere or due to respiration). The capacity of seawater to resist the addition of this acid is termed “buffering capacity.” Seawater with reduced buffering capacity exhibits a more pronounced pH change for a given input of CO2, mak­ing corrosion more likely for shells and skeletons of marine life. Buffering capacity is lowered in the Northeast pri­marily because of the region’s low water temperatures, which affect carbonic acid chemistry, and because of its many rivers that deliver large inputs of freshwater, carbon, and nutrients. Among the many industries that could be impacted by ocean (long-­term) and coastal (near­-term) acidification are commercial fishing, shellfish harvesting, aquaculture, and seafood distributors. These groups need objective information to help them prepare for and respond to the impacts of OCA. The scientific community needs their input to design effective monitoring and research strategies for the region. Policymakers in New England are beginning to address the issue of OCA. 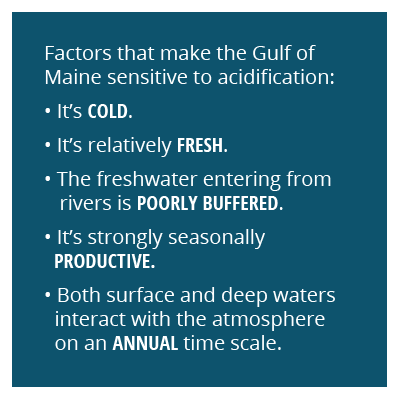 In April 2014, Maine established the Commission to Study the Effects of Coastal and Ocean Acidification and its Existing and Potential Effects on Species that are Commercially Harvested and Grown Along the Maine Coast. 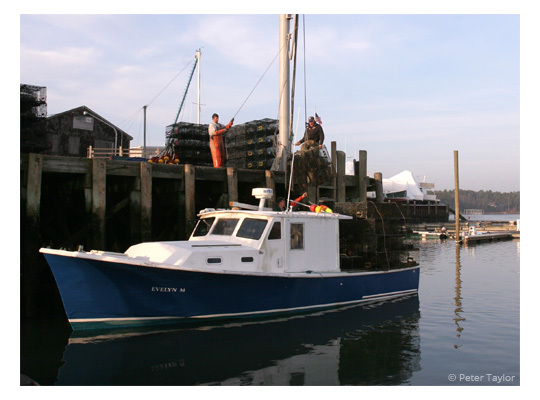 The commission reviewed Washington State’s OA Commission Report and reviewed the latest scientific information, partly informed through NECAN, and then issued its final report to the Maine legislature in December 2014. The report included recom­mendations to establish a Maine OA Commission and to conduct monitoring and research relevant to Maine. More information can be found on the Policy Working Group page. relatively fresher ocean water in currents that flow southward from the Arctic. These freshening trends could result in larger, more frequent plumes of corrosive river water entering the ocean. However, growth of phytoplankton plays an important role in controlling short-term carbonate dynamics, and without improved predictive capacity for how nitrogen, carbon, and phosphorus will change over time, we will be challenged to accurately forecast ocean and coastal acidification. Furthermore, it is largely unknown how the ecosystem as a whole will respond to ocean and coastal acidification. There is an urgent need to greatly expand monitoring of ocean and coastal acidification, to conduct biological studies in the region, and to link these studies to characterize present-day conditions and forecast future changes. Ocean and coastal acidification can have important effects on marine life. Understanding those effects is a major focus of scientific investigations, including studies to characterize regional conditions. 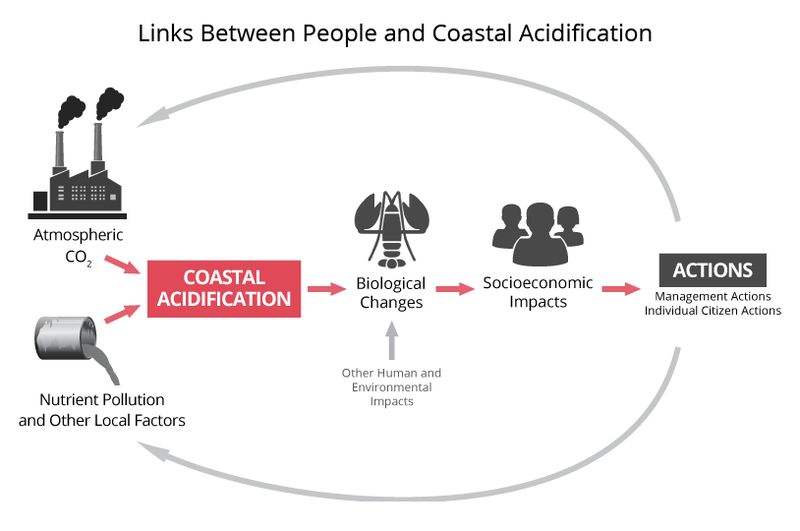 Unlike ocean acidification, coastal acidification responds directly to local influences, meaning people can take action to reduce coastal acidification where they live and work.